I'm making a small batch run of these. Double sided. If you want one, post your name up. Card will be cut to shape of guy (e.g. NOT a square). 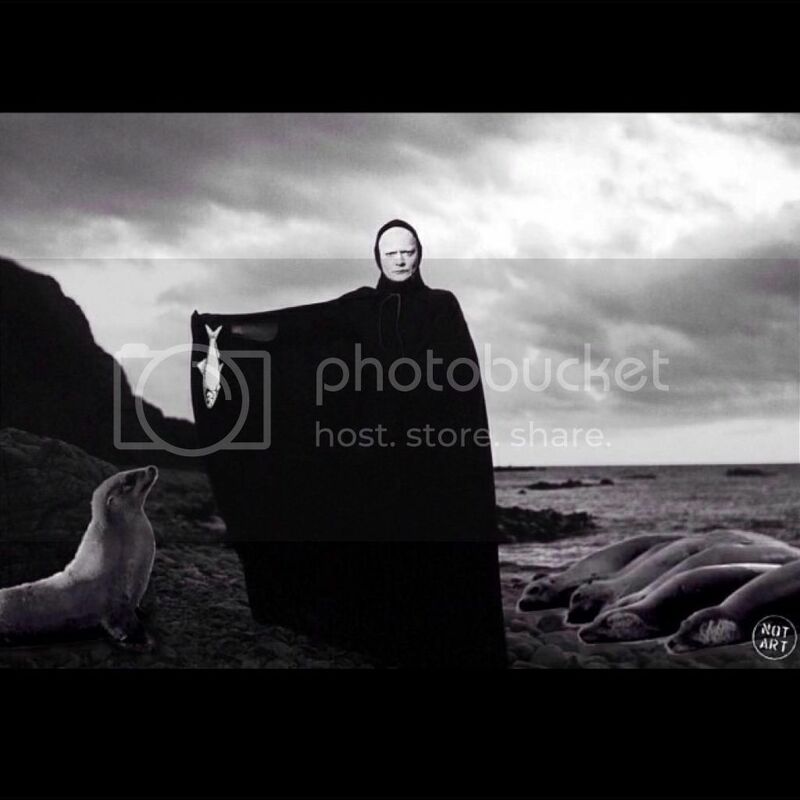 For those who may not know, the image is from the movie The Seventh Seal by Ingmar Bergman. The movie tells the journey of a medieval knight, and a game of chess he plays with the personification of Death, who has come to take his life. It is set in set in Sweden during the Black Death/Plague. The title refers to a passage from the Book of Revelation. The spoke card is the guy who is the "personification of Death. "All you white kids look alike when you're still covered in baby fat, so I was getting bored with the non-stop WASP parade. I would like one. Maybe one for my GF too that posted here like twice. So make that 2. Is that a yes?All you white kids look alike when you're still covered in baby fat, so I was getting bored with the non-stop WASP parade. chr|s sedition: I'm making a small batch run of these. Double sided. If you want one, post your name up. Card will be cut to shape of guy (e.g. NOT a square). For those who may not know, the image is from the movie The Seventh Seal by Ingmar Bergman. The movie tells the journey of a medieval knight, and a game of chess he plays with the personification of Death, who has come to take his life. It is set in set in Sweden during the Black Death/Plague. The title refers to a passage from the Book of Revelation. The spoke card is the guy who is the "personification of Death." ^ HAH!All you white kids look alike when you're still covered in baby fat, so I was getting bored with the non-stop WASP parade. Made the prototype today. Came out rad. Compare with size the BFG cat cards Zak made a year or so ago. I'll have these all done middle of next week, and will figure distro out then. Oh snap can I plz get one too? "Dude's just smashing fructosenormativity, lay off." ^ Does that mean you want one? I'm cutting the run at 15. So far we are up to 12. 15.All you white kids look alike when you're still covered in baby fat, so I was getting bored with the non-stop WASP parade. I think you live near me, so I can just swing by and pick them up when they are ready. I got all the photocopies made today. Since these are odd shaped, and double sideded, I have to cut each one out by hand, rubber cement the sides together, and then fine-cut each one. A bigger project than I first thought. I'm still hoping to have them done by Tuesday (when I'll have access to a laminator). So, I hope ya'll appreciate these, they are certainly a project of time & love!All you white kids look alike when you're still covered in baby fat, so I was getting bored with the non-stop WASP parade. gastronomin: Oops did I miss this? If there are extras I'd love one! You're in. 1 slot remaining! You can cut my GF out if you need space for someone that actually wants in. The sheets I ran the graphics off on had 2 per sheet. I made 8 copies. Thus, there are actually 16 to be had. Dan is the last person to get one. If you want one, but dicked around and didn't post up, sorry, you loose. Once they are done, if someone slacks on meeting me to get theirs, then I'll offer that to whom ever wants one, on a first-come-first serve basis. Final list is below. 16. DanAll you white kids look alike when you're still covered in baby fat, so I was getting bored with the non-stop WASP parade. ^ I assumed nothing. You indicted as such on Facebook. :)All you white kids look alike when you're still covered in baby fat, so I was getting bored with the non-stop WASP parade. Found two other prototypes I made. Total production run will be 18. Two more are available. 18.All you white kids look alike when you're still covered in baby fat, so I was getting bored with the non-stop WASP parade. Lamination done. Just need to cut them out.All you white kids look alike when you're still covered in baby fat, so I was getting bored with the non-stop WASP parade. If it's still available, I'll take that last spot. Thanks!We are the small axe. Ok, I cut them all out last night at work. Some of them are a little "crude," but you can obviously cut them down further when you get yours. I have a lot of left over stamps from Xmas. If you are not someone I see on a quasi-normal basis, or don't live near me (Davis Sq), I'd be happy to mail them out. Just PM your address.All you white kids look alike when you're still covered in baby fat, so I was getting bored with the non-stop WASP parade. I can get mine tomorrow or Friday. If not, I'll PM my address anyway. I'm up in Teele SQ. If you PMed me you address, they are being sent out today. Also, WTF is a "Furman Crescent?" That some crazy address, right there.All you white kids look alike when you're still covered in baby fat, so I was getting bored with the non-stop WASP parade. UNCLAIMED CARDS: PM your snail mail addy, and I'll mail it to you. 6. DanAll you white kids look alike when you're still covered in baby fat, so I was getting bored with the non-stop WASP parade. ^ Yup. I assumed that was going to be a big distro day.All you white kids look alike when you're still covered in baby fat, so I was getting bored with the non-stop WASP parade. chr|s sedition: Also, WTF is a "Furman Crescent?" That some crazy address, right there. ^ I drool. Let's. Pow-wow at Joe's?All you white kids look alike when you're still covered in baby fat, so I was getting bored with the non-stop WASP parade. chr|s sedition: ^ I drool. Let's. Pow-wow at Joe's? gastronomin: I live right behind Highland Kitchen, so v close to Davis. I pass through Davis to and from work M-F but can obviously pop over on the weekend. When are you around to meet up? What time pass through on way home? I'm often at Diesel before work in the evenings.All you white kids look alike when you're still covered in baby fat, so I was getting bored with the non-stop WASP parade. What time pass through on way home? I'm often at Diesel before work in the evenings.